Have a look at a lodge that is probably very different from the kind you are used to seeing - Templum Sion Lodge in Winnipeg, Canada, under dispensation from the Grand Lodge of Manitoba. In particular, be sure to read their original research papers. I was sorry to see that the Masonic Light Yahoo Group has been abruptly shut down. That is a shame, as it was one of the few shining areas where Masons from every obedience could chat freely, and often explored esoteric ares of discussion. The management of a list or forum can be a monstrous headache for its moderators, and Brother Josh Heller deserves major kudos for the fine work he has done over the years. Josh is the co-author of The Temple That Never Sleeps, a work specifically about the use of the internet as a way for Masons to communicate and share ideas. I'm sure all of us hope that this is a temporary situation, and that Josh is simply taking a rest. rejoice. Brother Ted Bastien has returned at last with a new Bugsport entry. We hope all has been well for him. EDIT: Ted has a new home for Bugsport. Obviously, we members of Lodge Vitruvian approve. Thanks to an anonymous tip! The final 2006 meeting of Lodge Vitruvian No. 767, F. & A. M., will be on Tuesday, October 24, 2006, at 7:00 p.m in the temple of Broad Ripple Lodge No. 643 F. & A. M., located at 1716 Broad Ripple Avenue, Indianapolis, Indiana. Our guest speaker will be Worshipful Brother Jon M. B. Porter, PhD and a Fellow of the Society of Antiquaries - Scotland. WBro. Porter is a Lecturer for the Change and Tradition Program at Butler University, and he is a Past Master of Mystic Tie Lodge No. 398 in Indianapolis. He will be presenting what promises to be a fascinating a paper on Masonic Neo-Templarism. The Festive Board will follow the meeting in the private dining room of the Capri Restaurant, 2602 Ruth Drive, Indianapolis, Indiana (Keystone Avenue between 71st and 75th Streets). Brethren wishing to imbibe are responsible for the price of their drinks. Please consume responsibly. This will be my last meeting as Master of Lodge Vitruvian, a position in which I have been proud and honored to serve for two years. My deepest and sincerest thanks to the many brethren I have met and served with during that time. Lodge Vitruvian is a unique institution in Indiana Freemasonry, and is the only European Concept lodge in the state. I am honored to have been allowed to help lead this small group of visionary Masons one or two steps into the future, and I have great hope for their destiny in the coming years. WFPL-89.3 FM Louisville "STATE OF AFFAIRS"
To the brethren in the Louisville/Southeastern Indiana area, I'll be appearing on WFPL-89.3 FM this Thursday, October 19th on "State of Affairs" with Julie Kredens between 11AM and noon. At one time or another we've all heard of the organization called the Freemasons. Maybe your grandfather or uncle is one, or a neighbor or friend; but have they ever told you what the Freemasons stand for, what their purpose is, or what goes on in their meetings? The history of Freemasonry begins in London, in June 1717, with the formation of the Grand Lodge of England. Freemasonry in America was established in the 1740's and the first Grand Lodge of Kentucky was formed in 1788 in Lexington, four years before Kentucky was admitted into the Union. So, what is a Mason? How does one become a Mason? What's with all the rituals and symbols? Why does Masonry seem so secretive? Join us Thursday, as we learn more about the Freemason from Chris Hodapp author of Freemasons for Dummies. The show archive is available in mp3 format here. God love the Masonic youth groups. I was asked to speak to the Job's Daughters this evening in Franklin, Indiana. The girls had a progressive dinner, starting at Englewood Lodge, moving to Hamilton Lodge in Fishers, then to Oriental and Speedway lodges for their various courses. By the time they got to Franklin, there were more than 75 people there, mostly the Job's girls. Dessert was served, and the girls sacked in for a movie and a lodge slumber party. National Treasure was on the bill, a picture that almost all of them had seen before, and all of them loved enough to watch over and over. Sir Knight George Ingles, Grand Inspector General for the Grand Commandery of Indiana spoke to the girls about the history of the Knights Templar, and I gave them a high-speed crash course in Masonic symbolism as it is used and abused in the movie. The young ladies were most kind to a certain Dummy - it's been a very long time since anyone referred to me as "awesome" - and I can't thank everyone enough for inviting me. Shout out to Becca, Jacie, Tara, the "Candy Corn Girls" and all the Job's Daughters who came out tonight. And to Gina Hodges, Grand Bethel Honored Queen, and her husband, Bro. Travis Hodges of Broad Ripple Lodge. Thanks for asking me. I had a fantastic time. I'm home and have now successfully caught back up to some semblance consciousness. What a fantastic experience the last few days have been. I don't how to adequately thank the brethren of Highlands-Unity Lodge No. 168 for inviting me to Edmonton, Alberta to speak to their lodge's festive board. A very special note of thanks goes to RJ, Linda and Kaitlyn Hayes for their incredible hospitality. I've not been to Canada before. It's remarkably home-like, apart from their spineless knuckling under to the metric system, rabbits the size of push-mowers, better beer and a peculiar fascination with hockey. They HAVE to have socialized medicine there. They all have puck injuries. Here in the States, Monday was Columbus Day, most renown for the inconvenience of closed banks, shuttered post offices, vacationing government squints and the occasional Indian (feather, not dot) protest over celebrating the discovery of a place that already had people all over it. But in Canada, it was Thanksgiving, and I was given the opportunity to share the holiday with RJ's family. I'm sure that's just what they needed - another mouth to feed and some stranger underfoot while orchestrating the traditional madness of a dozen relatives, three cats and a dog around a five-person table, plus a 35 lb. turkey, five pies, three kinds of potatoes, four kinds of vegetables, and the inevitable, how the hell do you make gravy crisis. Worse, I was completely useless in holding up my end of the hockey discussions. The brethren of Highlands-Unity Lodge and their many visitors were exceedingly gracious and welcoming on Tuesday evening. The dinner at the posh Indian (dot, not feather) restaurant Haweli was wonderful, although a boy embarking on an all-day airplane ride should partake of incendiary-spiced beef and chicken with a little more temperance the night before - or so my fellow passengers told me. The restaurant was beautiful, and the food was outstanding. It appeared that somewhere between 40 and 45 brethren were in attendance to suffer through my remarks - fortunately for RJ, they bought the books before the speech. I have no idea if I said anything that sounded new to them - they seem to be a sophisticated lot who are already practicing their Freemasonry pretty successfully. It was great to have the opportunity of meeting brethren from so many lodges who came out for the evening, along with the Deputy Grand Master and Grand Secretary of the GL of Alberta. I love visiting different lodge buildings, so getting to see both Highlands-Unity (love the moose in the West) as well as Edmonton's beautiful Freemason's Hall was a treat. The presence of liquor in both Masonic halls was combined with the inexplicable phenomenon that the earth did not stop spinning on its axis. Amazing. I just don't understand how that could be. I thought a lodge building with liquor in it would burst into flames spontaneously. Spending time with fellow Knights of the North RJ Hayes, Jelle Spiker, Mike Bayrock, Stephen Dafoe, along with RJ's brother Peter and other brethren, was great, one of those strange "we only know each other from the Internet" gatherings that is getting to be a regular occurrence with me these days. Us Broad Ripple Lodge guys can sleep anywhere, but I regard the geniuses at Motorola as empyrean cherubim for having the divine wisdom to put alarm clocks in their cell phones so that largish, snoring, and slightly crapulous layabouts don't sleep through their final boarding calls. Thanks again to everyone who made the last few days truly an experience I will always remember. And most especially, I want to thank the Worshipful Master and officers of Highlands-Unity Lodge for their invitation and their warm welcome. The Empty Labyrinth has an brilliant piece from Monday. She wrote it about membership truisms and the Order of the Eastern Star, but they work equally well with Freemasonry. Unfortunately. So many times in the past ten years, we have maybe rushed a little too quickly to make changes in the fraternity because we say that's what young men want. That they don't have time to join or learn the old fashioned ways, or that proficiency requirements are too difficult for modern men. We've made these assumptions without asking them. They are coming looking for the very traditions that we sometimes want to wipe out, because we think that's what they want. Permit me a moment to brag on one of my lodges. Lodge Vitruvian No. 767 raised our newest Master Mason today, Brother Kenneth Davis. Our philosophy at Vitruvian is to bring a man through the degrees slowly, and it took Ken a year to do so. He knew this from the start, and I remember a year ago that he said something that made what we do seem worthwhile. He said that he had looked around the internet at other lodges, and if he hadn't seen ours and read about our philosophy, he probably wouldn't have petitioned the Masons. Vitruvian is Indiana's only European Concept lodge. When we started the lodge back in 2002, we were top-heavy with Past Masters, and frankly, past everybodys - brethren who were involved in everything in the state, the compulsive joiners of the Craft who were looking for something different. That was a tremendous help to get us started and up and running. But as the years began to pass, the truth was that we still had things we had to do that were part of the day-to-day job of running a lodge, those mundane, boring tasks that aren't new and exciting. As a result, we lost many of those early joiners and had to survive on our own merits. Best of all, we have many visitors who come and see what we do and take our ideas home to their own lodges. A case in point was our degree today. We had visitors who drove all the way from Nashville, Tennessee to see what we were up to. We had brethren from all over the state. We were short some members for parts, so brethren stepped up to help. Because of our unique membership from across Indiana, we chose to go on the road and confer the degree at Delaware Lodge No. 46 in Muncie. Theirs is one of the most magnificent Masonic facilities anywhere in the country, and it was an honor to perform the work in this beautiful lodge. Wbro. Eric Schmitz composed an outstanding new Volume of Sacred Law presentation and delivered it for the first time today. And in keeping with the uniqueness of our lodge and its members, after Brother Davis was presented with several gifts from the lodge, in return he distributed a gift to the brethren present - a medallion depicting the symbol of our lodge, Da Vinci's Vitruvian Man. It was the first time I had ever seen such a thing done, and I will cherish it forever. Ken is the second member we have initiated at Vitruvian, and the first while I have been Master. The design of Vitruvian has always been to remain small - no more than 36 members. The reason is to strengthen the personal bond between its members. I can't get to know 200 members of a lodge. But I can know and care about fifteen or twenty. As a result, the events of today will stay with me always. Bringing a new brother into our small family means so much to us all. My personal thanks go out to Wbro. Jim Dillman, without whom we would have been lost; Wbro. Tim Brinkmeyer, Master of Delaware No. 46, whose tireless work allowed the day to be a great one; Wbro. Dale Adams, for his strength and assistance; Wbro. Fred Dusel and Brother Jay from Nashville, for their kindness and their interest in what we're doing; to the many members of Delaware No. 46, and the other brethren from all over who stepped in to help; and of course to my friend, brother and evil twin, Wbro. Nathan Brindle, for all that he does. And congratulations to Brother Ken Davis, our newest Master Mason. 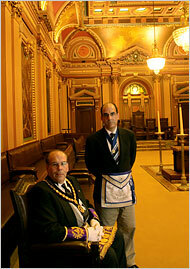 A story appeared yesterday in the New York Times about the Grand Lodge of New York. I'll risk the possible scolding of the Times for reprinting most of the article here, since they disappear after a few days. For more than two centuries, the Freemasons and their grandiose rituals have played a secretive, mysterious role in American life. One of the Masons' symbols looks a lot like the all-seeing eye on the back of every $1 bill. And look whose picture is on the other side. But the Masons' numbers have been steadily dwindling — whatever their secrets are, they apparently do not have one for avoiding death — and their ranks have been graying. So the New York State Masons have followed other state Masonic societies in doing something that they would have once considered heretical: they are actively reaching out for new members. And, in the process, a famously reticent fraternal organization that now puts a premium on its community service has lifted its veil of secrecy just a bit. "We're still not thinking of it as recruiting or trying to amass people,” said Thomas M. Savini, the director of the library at the New York Grand Lodge Headquarters, on West 23rd Street and the Avenue of the Americas, “but I think we’ve reached a point where we realized that not saying anything isn’t making it any easier." They had also reached a point where they could not ignore what others were saying about them in 'The Da Vinci Code' and other bestsellers like 'The Book of Fate' by Brad Meltzer. "What 'The Da Vinci Code' gave us was an opportunity to say, 'Here’s what we are,'" Mr. Savini said. As Mr. Bidnick explains it, New York’s Masons are heavily involved in community service, underwriting medical research and supplying 29,000 American flags, one for every public school classroom in the city. But still there are the secret rooms where Masons gather. "Why do we bring them into a room like this?" Mr. Bidnick asked. "Basically, all our rituals are designed to be educational. All these things they show you on TV, the assumptions are wrong." He described an encounter with a cable television reporter. "The woman from CNN read some passages about a rope and a hood and asked, 'Is that what you do?'" he recalled. "It's not." He has heard the conspiracy theories. "We’re often asked why we have a G" as a symbol, Mr. Bidnick said. "We had a person in here from CNN before 'The Da Vinci Code.' She pointed out that only in English and German does the word for God begin with a G. But masonry is an educational institution, so that G stands for geometry." And Mr. Bidnick said when Masons refer to God, they refer to the great architect of the universe. To hear him and Mr. Savini tell it, there is nothing theological in the reference. Mr. Savini said that Masonry was dogma-free. "It doesn’t tell a man how to interpret a symbol, which leaves it open to people outside to misinterpret it," he said. They would not describe in detail what happens in the room when members are present for a lodge meeting. Mr. Savini did dispel what he said were misconceptions — that there are secret tattoos, for example. "Masonry has nothing to do with tattoos," he said. "You don’t get a tattoo when you become a Mason." And Mr. Savini points out that the eye on the dollar bill is not really a Masonic symbol. “We use the eye,” he said, “but opticians use the eye. It makes us look ridiculous if we say it links into some Masonic connection that was not there." I guess I don't understand reporters. Tattoos?